With margins as tight as those found in the restaurant industry; owners and managers must be constantly vigilant when it comes to controllable costs. Labor is the highest controllable cost in most restaurants. Kitchen labor is the most expensive of all restaurant departments. So being smart about kitchen efficiency can make a big difference on your P&L statement. There are many ways operators go about using less work hours in their kitchens. This post offers five suggestions. 1. Plan to be within budget. The first and most basic step to controlling labor in the kitchen is to write a schedule that is within the labor budget. The best way to achieve this is to know what your budget percentage is and what your projected sales are. As you write the schedule, add up the amount of hours you have scheduled for each shift, multiply that by the hourly rates of each employee. Then divide that dollar amount by the projected sales for that shift. Follow that logic for each shift, day and, finally the whole week. You will probably notice that some shifts simply can’t be within budget. But other shifts will be under budget. Many restaurants run higher labor percentages in the beginning of the week then make up for it towards the weekend. This is to be expected. But if the schedule is written out of budget to begin with, there isn’t much hope for achieving your labor goals. The best staff is well trained. Training should be treated as an investment that will improve your operation and decrease grey hair count. If you skimp on training, your results will show it. Cross training is a must. On slower shifts move some of the crew to new areas. This will give you better schedule flexibility, and increase the value of your staff. In some cases, one well trained employee can run the whole line when it’s slow. This allows other employees to get ahead on prepping, cleaning etc. Constantly hiring and training is expensive and inefficient. Do everyone a favor and hire great people! Once you have a great crew- work to keep them. Involve the kitchen in obtaining efficiency goals and hopefully reward them with raises when they deliver. This way they can be motivated into cutting their own hours. If your menu is prep intensive, you must get creative in the way you write a prep list. First, look at what items you can “batch” prep. In other words, look at which prep items have a longer shelf life and make larger batches of those items. It takes just as long to make 10 gallons of Texas chile as it does to make 5 gallons. Be careful, but don’t prep everything everyday. Second, categorize your prep list. If one person is working with raw produce, they need to be near a prep sink. Therefore, let them do everything on the prep list that involves fruits and vegetables. Have another person do all the the dressings and sauces etc…. In many kitchens on many mornings, there is a scramble. And not just eggs. 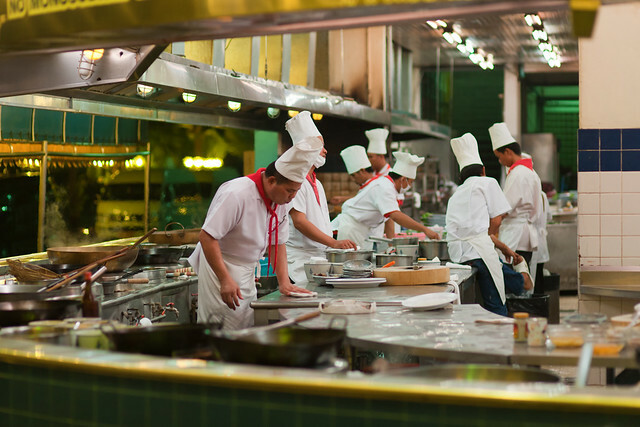 Very often, when cooks and prep cooks come into work, they spend the 1st 15-20 minutes getting ready to work. This is especially true of the morning shift. When they arrive, they have to find all of their utensils, track down a manager to give them aprons and towels, make coffee, and watch water boil. You can save a lot of hours by getting everything ready for their shift ahead of time. A great way to do this is to have the closing crew leave clean utensils on the corresponding work stations before they leave. In the morning, have the prep list written, ovens preheated, water already boiling, aprons and towels out, coffee made etc…, by the time the crew comes in. Then, have the crew from that shift pay it forward to the the next shift. The difference is a crew that comes to work and produces versus a crew that comes in and gets ready to work. Hopefully these suggestions will inspire your own ideas to increase profitability. Good Luck and Good Kitchen Labor! Posted in Back of House, Food Quality, How To, Labor Cost, Management, Profitability, Restaurant.